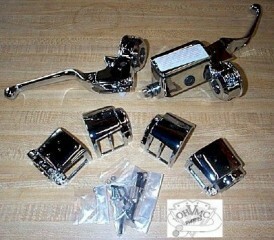 Chrome plated OEM style handlebar control kit w/late style ergonomic levers. Includes chrome switch housings, clutch lever bracket and lever, a 5/8" bore master cylinder for single disc or a 11/16" bore for dual disc and brake lever. Will also work with customs and new construction projects. Will not work with models equipped with radio and or cruise controls.